We’re launching our new Sample to Insight QIAact Myeloid DNA UMI Panel! 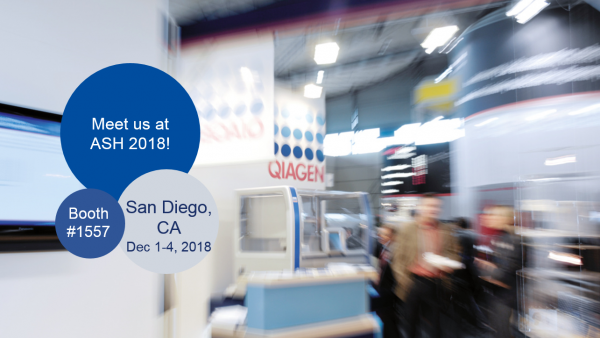 We are unveiling our new Sample to Insight QIAact Myeloid DNA UMI Panel at the American Society of Hematology (ASH) 60th Annual Meeting and Exposition held December 1-4, 2018, in San Diego, California. Stop by booth #1557 at ASH to explore our complete Sample to Insight solution for interrogating 25 genes for variants with known significance to clonal myeloid malignancies. Coupled with QIAGEN Clinical Insight (QCI) Analyze and Interpret, QIAGEN’s secondary and tertiary NGS analysis platform that provides seamless variant detection, interpretation and reporting based on actionability tiers from the 2017 AMP/ASCO/CAP guidelines, the streamlined solution enables sub-classification and prognostic assessment of hematological malignancies, including leukemia, Non-Hodgkin lymphoma, Hodgkin lymphoma and multiple myeloma. QCI Interpret for myeloid malignancies offers a specialized workflow that guides prognostication and treatment decisions. With features that incorporate cytogenetic information, World Health Organization (WHO) somatic frequencies, and variant-level prognostic evidence from the QIAGEN Knowledge Base, QCI Interpret helps you assess actionability through multiple levels of information. Meet and talk with our experts at ASH 18, booth #1557! QIAGEN’s ipsogen portfolio: a wide range of CE-IVD marked oncohematology diagnostic assays for determining an individual’s biomarker status. QIAact Myeloid DNA UMI Panel: a complete Sample to Insight assay. QIAseq Targeted DNA Human Myeloid Neoplasms Panel: a complete Sample to Insight digital DNA sequencing solution. QCI Analyze and QCI Interpret for Myeloid Malignancies: secondary and tertiary NGS analysis platform with a specialized prognostic workflow. Check out our Sample to Insight oncohematology solutions here.